ITN Converter, better known as ITNConv, is both a converter route supporting many formats, and a route planner simple and efficient. 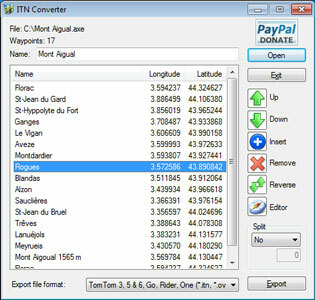 The converter supports routes file formats (roadbook) from many GPS or mapping software, the most popular are TomTom, Navigon, Garmin, MapPoint or MapSource. This converter can easily transfer a route created by a GPS or mapping software to another GPS or mapping software. So you can download routes from many web sites, and convert it to the file format supported by your hardware. "PFE aficionados" will love the travel version that can be put on a USB key. This version is identical to that desktop one, except that preferences are saved in a file instead of the registry. It's portable and stealth. Voted.